Starring roles in history film! 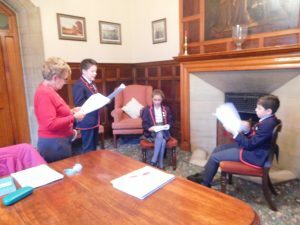 Today was an exciting day for our Year 6 pupils – as they began their dramatic journey to starring in a film! The short film, which is intended to be shown at the Ashby Arts Festival, is based around the mystery of Roesia de Verdun. It is being produced by local film company, Pudding Bag Productions, who were ‘Heritage Group of the Year for Leicestershire & Rutland, 2016-17’ and who specialise in exploring, presenting and widening access to history and heritage through film-making. 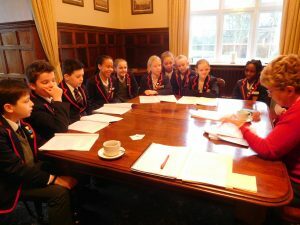 Year 6 have been eagerly awaiting the first rehearsal and were enthralled when Wendy from Pudding Bag Productions explained about the project and introduced the script. They a re now very much looking forward to when filming begins at Grace Dieu at the beginning of March.